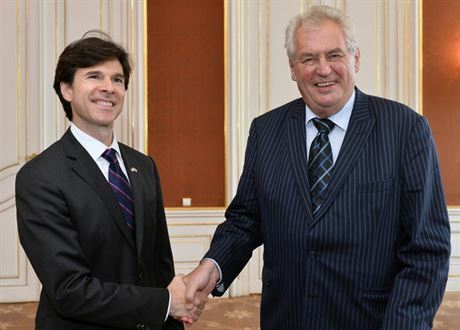 The US ambassador to Czech Republic, Andrew Schapiro, has been barred from Prague Castle, President Milos Zeman says. Prague Castle is the president’s official residence and office. The apparent snub follows remarks by Andrew Schapiro seen as critical of Milos Zeman’s decision to attend forthcoming World War Two commemorations in Moscow. Several world leaders are boycotting the ceremony over Russia’s role in the Ukraine conflict. Milos Zeman is considered more sympathetic to Russia on the issue. Andrew Schapiro had “overstepped the mark” by criticizing the decision to attend celebrations in May marking the anniversary of the end of WW2, news portal Parlamentni Listy quotes President Milos Zeman as saying. Because of this “the doors of the castle were closed” to Andrew Schapiro, Milos Zeman continues. Milos Zeman’s spokesman Jiri Ovcacek later sought to downplay the president’s comments, saying that Andrew Schapiro could still take part in social events at the Castle. Andrew Schapiro is quoted by Czech media as having said in March that it would “be awkward” if Milos Zeman was the only statesman from an EU country on the platform on Red Square. The US embassy has declined to address Milos Zeman’s comments. Milos Zeman is known for his outspoken views on a range of issues, often at variance with those of the Social Democrat-led government, correspondents say. The presidency is largely ceremonial in Czech Republic, but Milos Zeman became the first man directly elected to the post when he took office in 2013.